Posted on 09/27/2017 by Mickey McCarter	in Live Review and tagged dark wave, Drab Majesty, goth, Los Angeles, post-punk, Songbyrd Music House. Rob Sheffield of Rolling Stone, one of my favorite music and cultural commentators, described New Order as “goth-disco kingpins” in his review of a New York City performance in 2016. My younger self might have quibbled with Rob’s nomenclature, but older me accepts a deeper truth on categorizing bands: Often what occurs in the wake of their initial releases — sometimes over the span of decades — often has a big impact on how we classify and view bands and the genres in which they play. 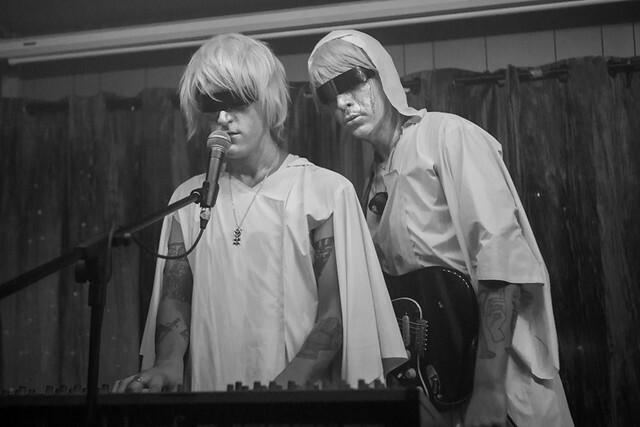 Enter then Drab Majesty, a Los Angeles electro-goth duo, with full awareness of this truth. Drab Majesty are the result of a vision, and the resulting music fulfills a fully conceived niche consciously devised by its creators. Deb DeMure, the androgynous persona of Andrew Clinco, and Mona D are those creators, and they brought their act to Songbyrd Music House on Friday, Sept. 22 to perform for a very full room. Before I go much further, let me observe that Drab Majesty will surely play a larger club upon their return to DC. They’ve been passing through regularly, and they are steadfastly attracting more and more attention each time they come back. 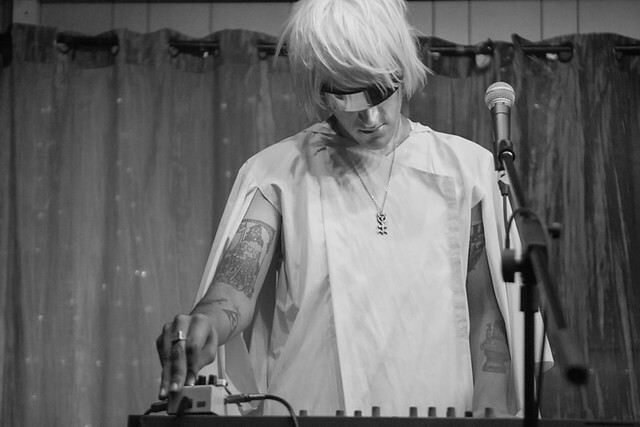 Deb mostly played guitar and Mona mostly played keyboards during the show, which consisted of roughly eight long-form renditions of songs from the Drab Majesty catalog. The recent round of touring followed the release of The Demonstration, the duo’s full-length second album, via DAIS Records in January. Drab Majesty began their show with “Dot in the Sky” from that sophomore album, and it’s easy to see some parallels between their work and New Order’s debut album Movement. Both are characterized by pleasing melodic synths and an expansive, unwinding song structure. Deb’s vocals were more haunting, and he seemed to affect a deliberate deep yet distant singing style that actually put the audience at ease. 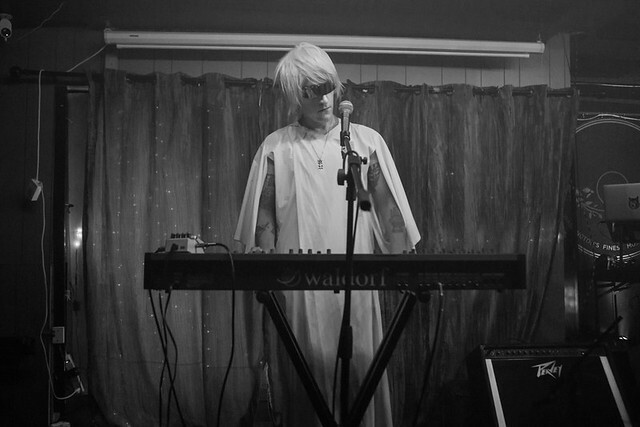 One thing surely deliberate is Drab Majesty’s haunting appearance. 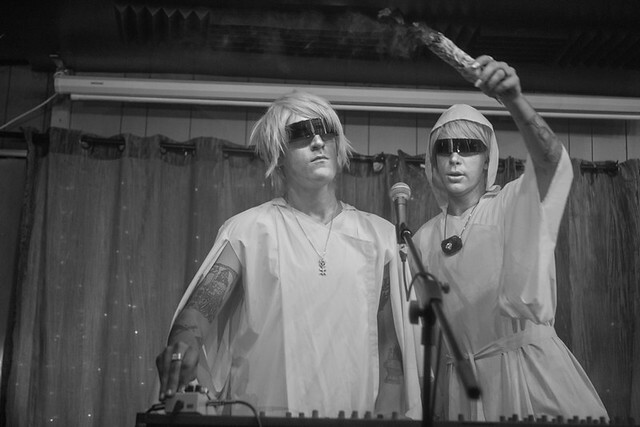 The two appeared on stage in robes and futuristic shades with chalk white skin and hair as if ghosts twice removed from your memories of how Bauhaus might have appeared in music videos if you weren’t really paying much attention. 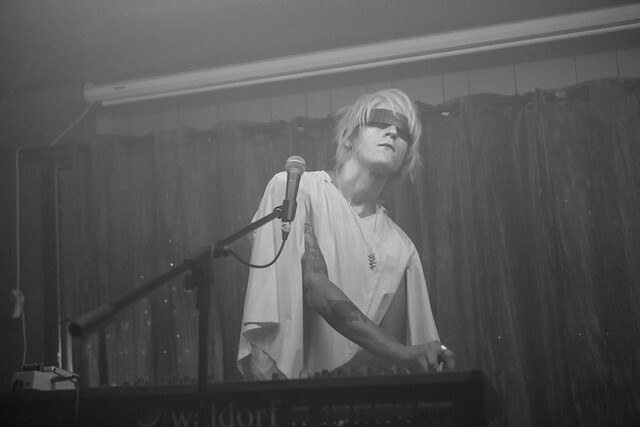 Billowing fog filled the room, and Deb occasionally cut through it with a light strapped to his chest, a clever mechanism that added to the otherworldliness of the Drab Majesty stage act. The music kept coming in the form of The Demonstration’s “39 by Design,” “Cold Souls,” and “Not Just a Name,” among other selections. Our DC crowd was mesmerized, peacefully entertained by the retro stylings of carefully crafted songs. Deb classifies Drab Majesty’s music as “tragic wave,” and in this there is the understanding of its moorings. It has all of the sweeping romanticism of the best of new wave instrumentation while being utterly preoccupied with loss and death, crystalizing feelings on impermanence in lyrics. In my concert experiences, Drab Majesty sits comfortably next to dark wave contemporaries like Cold Cave and The Faint. 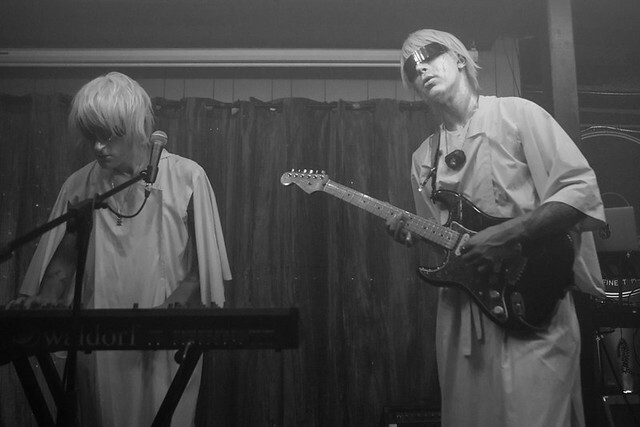 If you like those acts, Drab Majesty is definitely a band to add to your “must-see” list. Drab Majesty perform in Toronto tonight, Sept. 27, and continue touring the United States tomorrow. The duo wraps their current spate of touring at home in Los Angeles with the Cloak and Dagger Festival on Oct. 20. Personally, I would like to see more of the people behind the makeup in a future performance. 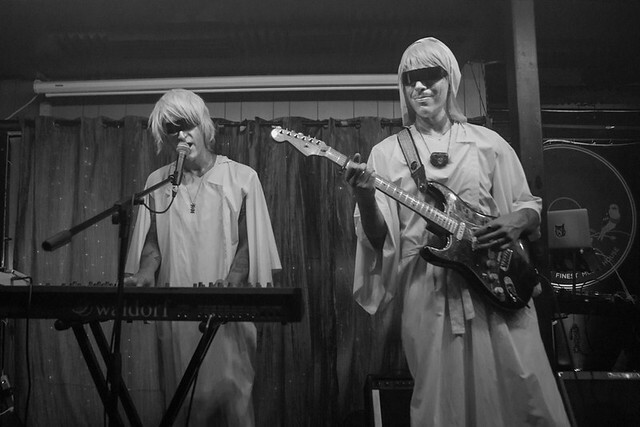 If I’m not mistaken, Drab Majesty set up and tuned their own instruments prior to their performance Friday, and it was intriguing to see the faces of the musicians making the music. 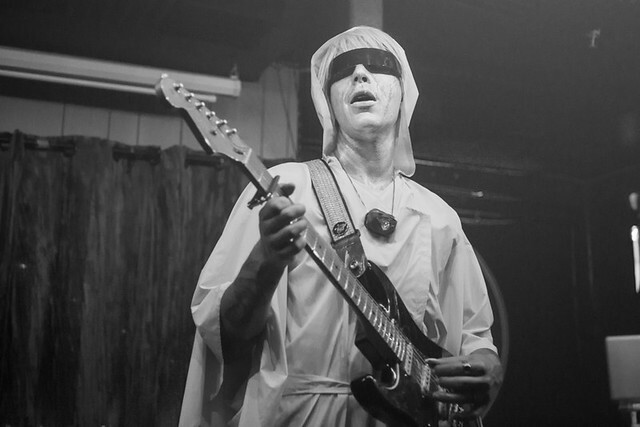 I fully understand the stagecraft and reasons for why Drab Majesty present themselves as they do, but I wonder how much more powerful a more human visage could be in a different show. 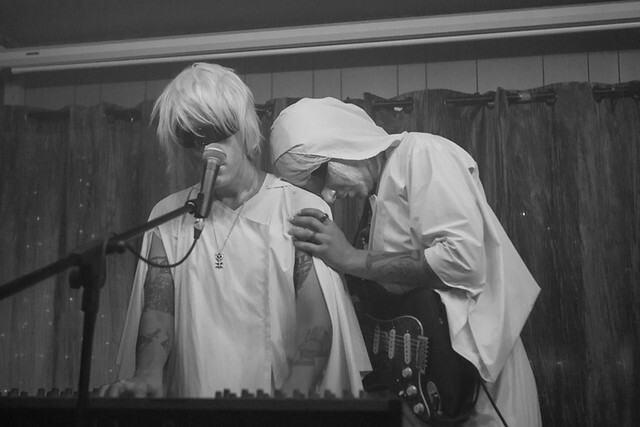 Here are some pictures of Drab Majesty performing at Songbyrd Music House on Friday, Sept. 22, 2017. All photos copyright and courtesy of Paivi Salonen.